How much does it cost to set up and maintain a seahorse tank? What sort of expenses does this hobby involve? The start up costs for a suitable marine aquarium can be substantial. Of course, much depends on the size of the tank and the type of filtration it includes. To keep expenses down, some hobbyists opt for a very basic setup. Seahorses can certainly be kept very successfully in such simple setups, as long as you are aware of the limitations of such systems. For example, the filtration system can be as basic as a set of well-maintained undergravels that covers the bottom of the tank completely. I know undergravel filters are considered old-fashioned technology nowadays, but they are inexpensive, utterly reliable and foolproof (no moving parts), easy to install, require no modification whatsoever, and work extremely well for seahorses. An inexpensive diaphragm air pump will operate the filter and provide all the aeration you need, or you can upgrade to powerheads for greater efficiency and extra water movement. It is a good idea to supplement the undergravels with an inexpensive hang-on-back filter or canister to provide better circulation and accommodate chemical filtration media. This is a very simple, inexpensive aquarium that’s extremely easy and economical to set up and operate, yet it can be very successful if used within its limitations. For instance, undergravel filters are notorious nitrate factories and the hobbyist must take measures to compensate for this fact. This simple system relies totally on water changes to control nitrates. There is no live rock or live sand bed to provide denitrification, no algal filter or denitrator in a sump, and no protein skimmer to remove organics before they enter the nitrogen cycle. This limits the carrying capacity of the tank and makes an accelerated maintenance schedule and more frequent water changes an absolute necessity. For this reason, reverse flow undergravels often work best with seahorses, rather than traditional undergravels; they help prevent detritus from accumulating in the gravel bed. However, because of these limitations, I don’t recommend this type of very basic setup for inexperienced hobbyists. It is economical but it is a bit more demanding to maintain than other systems and doesn’t provide beginners with a good enough margin for error in my opinion. I think first-time seahorse keepers would be better off investing a little more to obtain a system that will be more forgiving and increase your chances of success accordingly. It would recommend an aquarium at least 20-inches tall (the taller the better) that holds at least 30 gallons, and is equipped with a wet/dry trickle filter for ultra-efficient bio-filtration. You will have to visit a good local fish store to see what the actual costs would be for a tank and accessories that meet those specifications, but you should count on spending around $300-$500 for your initial investment. 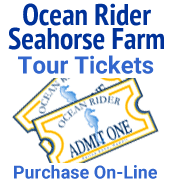 For example, Ocean Rider offers their Sea Ranch, which includes everything you need to get started, including a mated pair of beautiful captive-bred-and-raised seahorses, for $425. Once you’ve made that initial investment, however, the costs of maintaining a seahorse tank are quite inexpensive. They consist mainly of the electricity required to run the aquarium equipment, food, and an occasional bag of artificial salt mix when doing water changes. All of these are very modest expenses. For example, the food for your captive-bred seahorses will consist of frozen Mysis shrimp and a 6-oz package of frozen Mysis will last a pair of seahorses for several months.